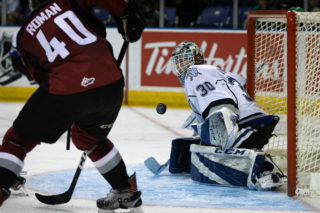 Victoria’s comeback attempt halted as club drops 6-5 contest to Tri-City; Game 4 goes tomorrow. 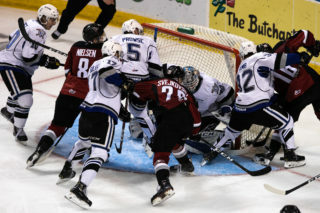 Kennewick, WA – The Victoria Royals scored five goals in the final frame, but were unable to erase a 5-0 deficit, in a 6-5 loss to the Tri-City Americans and now trail their best-of-seven series 3-0. Royals – Igor Martynov 1g-1a, Lane Zablocki 1g-1a, Tarun Fizer 1g-0a, Andrei Grishakov 1g-0a, Dante Hannoun 1g-0a, Matthew Phillips 0g-1a, D-Jay Jerome 0g-1a, Ralph Jarratt 0g-1a. Tri-City – Jake Bean 0g-5a, Morgan Geekie 3g-1a, Michael Rasmussen 1g-3a (Game Winner), Nolan Yaremko 1g-1a, Dylan Coghlan 1g-1a. 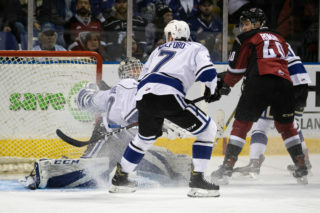 Goals Galore – The Royals’ five-goal third period set the new franchise record for most tallies in a single playoff period. The previous record was four and occurred twice, most recently back in the second period of Game 1 in Round 1 of the 2015 WHL Playoffs against the Prince George Cougars. 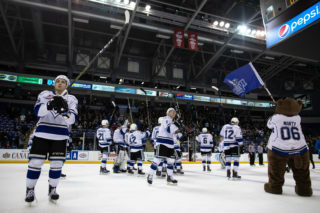 Playoff Firsts – Forwards D-Jay Jerome, who recorded an assist, and Andrei Grishakov, who scored a goal, each tallied their first playoff point as a Royal. Tarun’ It Up – With a goal tonight, Victoria rookie Tarun Fizer (2) sits second in goals among 2001-born skaters remaining in the playoffs. Fizer only trails the Lethbridge Hurricanes’ Dylan Cozens who has tallied three markers. 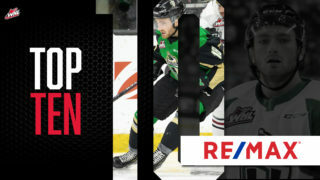 On The Road Again – The Royals will battle the Tri-City Americans in Game 4 tomorrow night with puck drop is slated for 7:05 p.m.
Game 5 – If necessary, Victoria will return home this Friday for Game 5 versus Tri-City with puck drop scheduled for 7:05 p.m. Tickets can be purchased in person at the Select Your Tickets box office, over the phone by calling 250-220-7777, or online at www.selectyourtickets.com. 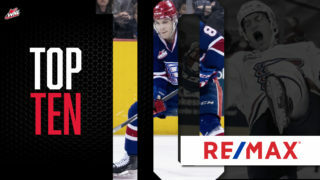 Game 4 – Wednesday, April 11th – Toyota Center – 7:05 p.m.
Twitter Handles – @victoriaroyals, @TCAmericans, @Jerome__15, @AndreiGrishakov, @FizerTarun.